Since its debut on Netflix on Boxing Day, You has become one of the most talked-about shows, both in life and on social media. Set in the gritty side of Manhattan, New York, You follows a book store manager, Joe Goldberg (Penn Badgley, Gossip Girl), who develops an invasive obsession with a young woman who visits his store. The woman, Guinevere Beck, who goes by her surname ‘Beck’, is an MFA poetry student at NYU and is an aspiring writer. From their first meeting, Joe’s fascination for Beck unravels into major stalking. Every episode of You gives an immense insight into both Joe and Beck’s state of mind through a voice-over; one showing Beck’s manipulative behaviour and the other displaying the development of Joe’s unhealthy obsession. After they first meet, Joe researches Beck, instantly finding her social media accounts that are set to public. Through her Twitter, Joe learns where she was born and raised, the names of her siblings and that she previously studied at Brown University, before relocating to New York. On her Instagram, Joe learns of the dates and times she teaches yoga classes part-time, as well as the identities of her closest friends, Peach, Anika and Lynn. He finds an image of her outside of her apartment and drags that image to Google Maps to locate her exact address. You is a lesson to every social media user that their privacy settings are very important, and that oversharing every aspect of your life can be, in some cases, pretty detrimental. Through Joe and his obsession, audiences learn that because of social media, anyone in the world can know every detail about you without even knowing you from Adam. Joe uses the details he finds on her social media as a means of morphing himself into her perfect guy. Once Joe finds her address, he starts to follow her to University, to meet-ups with her friends, and monitors her every day from her apartment window. One night Beck goes to an open mic night to share her poetry but gets drunk to drown her sorrows after her work isn’t well received from the audience. Beck wanders to the subway and is so unstable on her feet that herself and her cellphone fall onto the train tracks. Joe, who has followed her into the subway, saves her life by pulling her out of the way of an oncoming train. Joe and Beck share a cab back to her apartment, where Beck’s disrespectful and toxic boyfriend is waiting for her. After saying her goodbyes, Joe pulls out her cellphone. With her cell being attached to her iCloud account, Joe is able to go on her social media and use her phone to read every single text she gets. Through the voice-over, Joe declares to Beck that he knows her and that he will love her in a way that is everlasting like she deserves. Joe’s obsession becomes so all-consuming, to the point where he will do anything to get her, including getting rid of her boyfriend and friends to have her all to himself. Outside of Beck, Joe lives in an apartment next door to a woman named Claudia, who has a boyfriend who is always yelling and is abusive, and this chaos leads to her neglecting her son, Paco. Joe befriends the young boy, offering him refuge from his mom and boyfriend, feeding him and offering him different books regularly to help broaden his perspective. Audiences are under the illusion that Joe really is a nice guy upon seeing how well he treats Paco, yet soon discover that Joe is slowly manipulating Paco into his dangerous way of thinking. 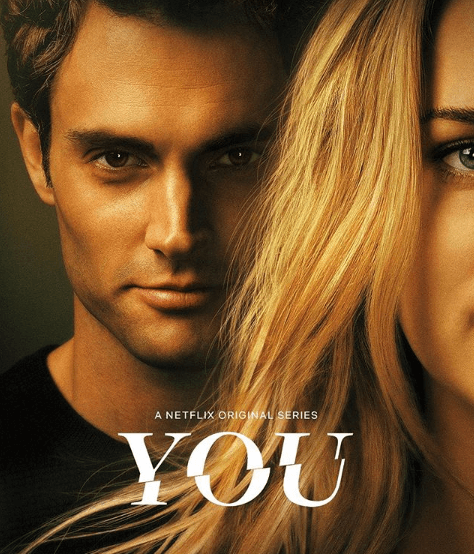 You is an excellent show for those that like to binge-watch. Every episode is dripping in suspense that it is impossible to stop watching, comparable to a book so good that you refuse to put it down. Although macabre in nature, You is incredibly appealing to young audiences and is chillingly relevant to today’s social-media-saturated society. The acting in the show is impressive; each actor brings moral ambiguity and multi-dimension to their character. Penn Badgley is a natural in the role of Joe, showing both the cunning and charming side of his psychopathic character. Elizabeth Lail gives a good performance as Beck, who in many ways is just as messed up and manipulative as Joe. The actor who stands out the most in You is Shay Mitchell (Emily Fields in Pretty Little Liars), who plays the role of Peach. Peach is spoilt, manipulative, openly rude to those she doesn’t like (Joe) and is the epitome of a drama queen. Peach, like Joe, has developed a less obvious obsession with Beck, and their rivalry is a needed comic relief. Although You touches on real issues, it becomes far-fetched and impossible to take too seriously. However, it is definitely worth checking out. Season 1 of You is available to watch on Netflix now.